This is Cello online program. The cello is a string instrument, usually with four strings tuned in perfect fifths. It is the smallest, highest-pitched member of the cello family of string instruments, which includes the violin and viola. An electric cello is a cello equipped with an electronic output of its sound. The term most properly refers to an instrument purposely made to be electrified with built-in pickups, usually with a solid body. 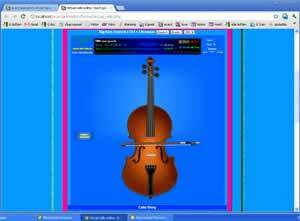 Virtual cello online is to practice playing cello on the internet. Music can be played by the cello as a file (files.mid) upload to try to play the same. Can determine the speed of play. The training. Save the music you play as a file (files.mid) to play on your computer.